The poor weather conditions on the day did not deter the community from coming together to support the event and it truly was a battle of the greats amongst our townlands best, the ultimate prize to become the townland champion. After a great day of football and craic Meigh Village came out the winners. 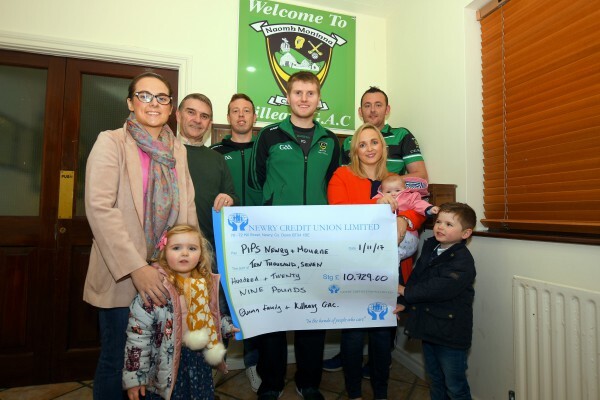 With incredible support from St. Moninna's G.A.C. family, friends and local businesses the amazing total raised was £10,729.00 the proceeds of which were donated to PIPS Newry & Mourne. PIPS Newry & Mourne would like to extend their grateful thanks and appreciation to the Quinn families, Killeavy and Camlough and everyone who supported the event for this very kind donation.